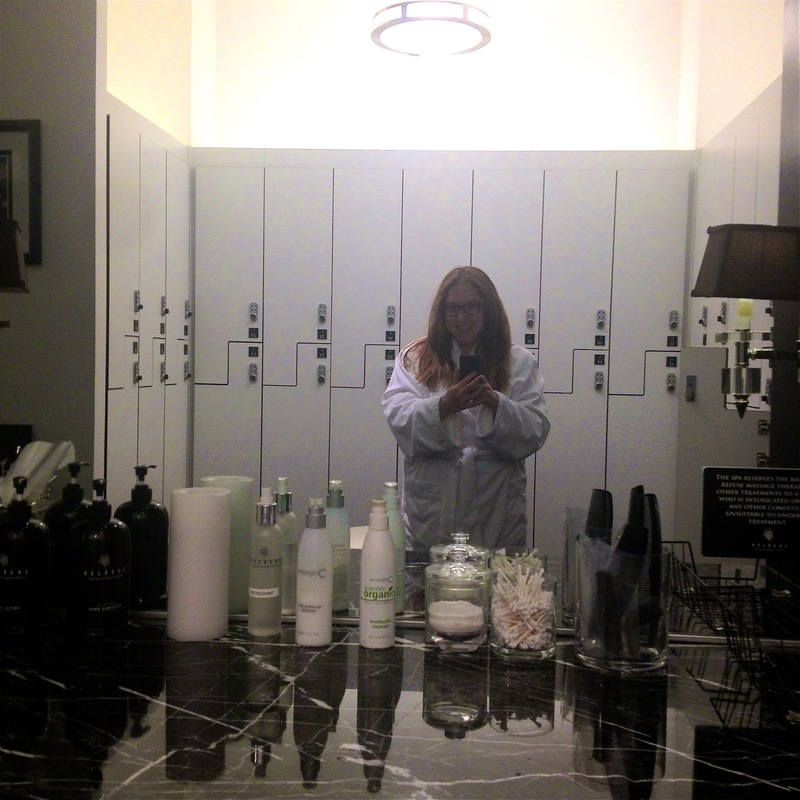 Over the summer, I had the opportunity to visit the glorious Relache Spa at the Gaylord National Resort in National Harbor, Maryland. As luck would have it, I was already visiting one of my best friends, who happens to live in Maryland, and fate brought the spa into my life at the right time! 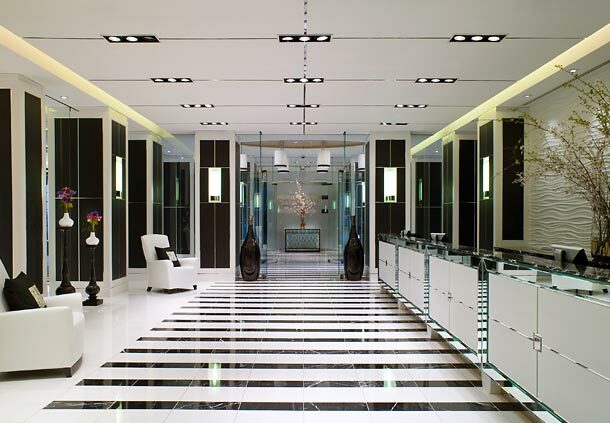 The luxurious lobby at the Relache Spa. Would you believe me if I tell you this spa is off the charts incredible? Because it really and truly is. The name of the spa, Relache, comes from the French meaning "to let go" or "take a breather" -- and that's exactly what you'll do here. Relache Spa believes in the power of taking a break from everyday activity and the benefits of physical de-stressing to calm and relax the mind, body and soul. I was invited into the spa to experience the Detoxifying Body Wrap, which I can honestly say involved some of the most relaxing and stress-less 80 minutes of my life. Well, more like 180 minutes, since that's about how long I spent taking advantage of everything the spa had to offer. The immense locker room at the Relache Spa. And then came the treatment. Ohhhhh, the treatment. The Detoxifying Body Wrap started with a natural organic exfoliation with a customized aromatic scent. And while I sometimes find exfoliation to be on the painful side, especially as it's done dry, this was somehow quite relaxing and put my body at ease immediately. This was followed by a thin thermal mud mask, which worked to eliminate toxins and increase circulation -- and then I was wrapped up into a cocoon for about 20 minutes to let it really soak into the skin. As if THAT weren't enough, the treatment ended with a full body massage. In case you're wondering, my skin was super velvety at the end of the wrap, not to mention I had dozed off for a good 30-40 minutes, so I was beyond relaxed! Enjoying myself immensely after my treatment. Can you tell how relaxed I was? The Gaylord National Resort also was kind enough to treat my friends and me to an absolutely delicious, luxurious, spectacular dinner at Old Hickory Steakhouse. Now, I am not usually a steak eater ... but I decided to make an exception and ordered the New York Strip. It was tender, juicy and flavorful -- a true delight. We also partook in the tableside cheese presentation, which included a selection of artisanal cheeses presented via cart (we were so overwhelmed that we just let our waiter choose for us, all of which were completely delicious). My friends and I left satiated and completely happy and at peace ... and, to accompany the comatose-like state I was in during my spa treatment, now I was in a food coma. The tableside cheese presentation. Does that look delicious or what? My New York Strip steak. I ate every. single. bite. If you ever find yourself in the National Harbor area, you simply must head to the Gaylord National Resort and discover everything they have to offer. My only regret is that I don't live closer -- because the Relache Spa would certainly become my go-to spot. For more information about the Gaylord National Resort, Relache Spa and the Old Hickory Steakhouse, visit marriott.com. Wow! That looks amazing and sooooo relaxing. oh my gosh this place looks incredible -I need a spa day! I want to go there! It looks amazing. I already feel relaxed by just looking at your photos. Nirvana! This looks so nice. I love spa days and I actually need to go book me one soon. Just the pics make me relax! It looks so beautiful in there! Sounds like an amazing experience! Wow!